Pest description and crop damage Black vine weevil (BVW) is probably the most common weevil to infest blueberries, but the strawberry root weevil (SRW) and rough strawberry root weevil (RSRW) are also pests. Adult weevils are from 8-12 mm long, depending on the species. Adults are reddish brown to black; the BVW is larger and darker than the other species. Larvae of all species are quite similar in appearance and habits: they are C-shaped, legless, and white with tan heads, up to 12 mm long. Adult weevil feeding causes a characteristic notching in the leaves of blueberries and other host plants. This feeding damage is relatively minor and causes little damage to the plants, but adults may contaminate fruit in mechanically harvested fields. Larvae feeding on roots can cause stunting and poor yields in young plants. With severe infestations, young plants may die. Biology and life history Weevils overwinter as larvae in the soil. Feeding may occur throughout mild winters. In April-June, larvae pupate, and adult emergence occurs. Adults are night feeders that remain in the soil or in debris at the base of the plant during the day, then climb up to feed on leaves at night. Adult weevils cannot fly, but walk or are carried from one location to another on plant material or by equipment. All adults are females capable of laying hundreds of eggs. Adults are slow moving and should not be confused with swifter predacious ground beetles. 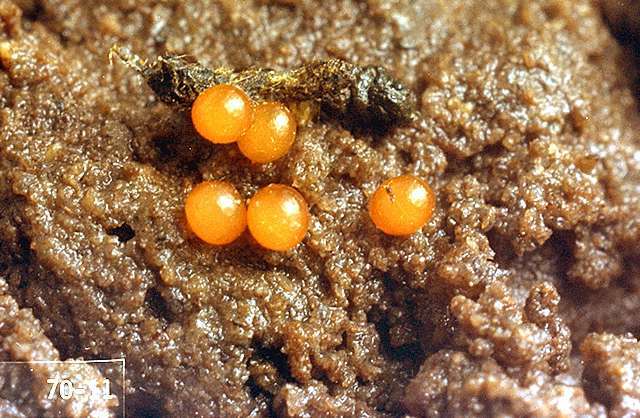 Eggs are laid in clusters in or on the soil from June to September. The eggs hatch and the larvae immediately wriggle through the soil to begin feeding on roots. There is one generation per year. Scouting and thresholds Inspect leaves for notching from adult feeding in early summer. Controls should be undertaken soon after adult feeding is observed, but before egg laying occurs, generally about four weeks. Presence of adults can be confirmed by night inspection of foliage on warm, still evenings. Or, look for adults during the day by looking through debris at the base of the plant. Wrapping the trunks of the plant with cardboard will provide a refuge that can be checked easily in the early morning. beneficial nematodes-Heterorhabditis spp. and Steinernema spp., have shown some effectiveness in controlling larvae when applied as label directs, as a drench in the fall. 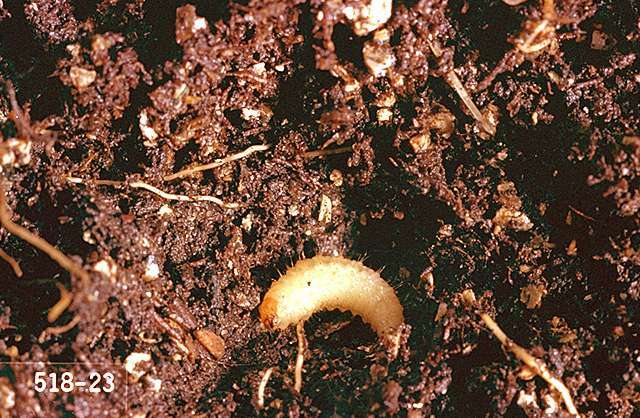 Nematodes must be placed in the root zone where weevil larvae are. Cultivating the soil in April-May before planting can eliminate overwintering larvae. Use a cereal cover crop, as small grains are not a host for root weevils. Home gardeners: hand-pick and destroy adults when found. Avoid making applications of insecticides to plants in bloom to avoid bee injury. Follow all label directions. zeta-cypermethrin-Toxic to bees; do not apply when bees are foraging. Apply foliar sprays at night, usually between dusk and midnight, on warm, calm evenings when adult weevils are on foliage and feeding. Control is usually poor when applied by day or on cold or windy nights. azadirachtin (Neemix and other brands)-Consult label for rate. Some formulations are OMRI-listed for organic use. bifenthrin (Brigade and other brands) at 0.05 to 0.1 lb ai/a. This is a legal pesticide use even though root weevils may not be listed on the label. Toxic to bees; do not apply when bees are foraging. cryolite bait at 4 to 8 lb ai/a. PHI 3 days. For adult weevil control, apply to the soil surface in the plant row. Washington and Oregon 24c labels (WA-980001 and OR-980006). esfenvalerate (Asana XL) at 0.05 lb ai/a. PHI 14 days. Do not apply when bees are foraging. 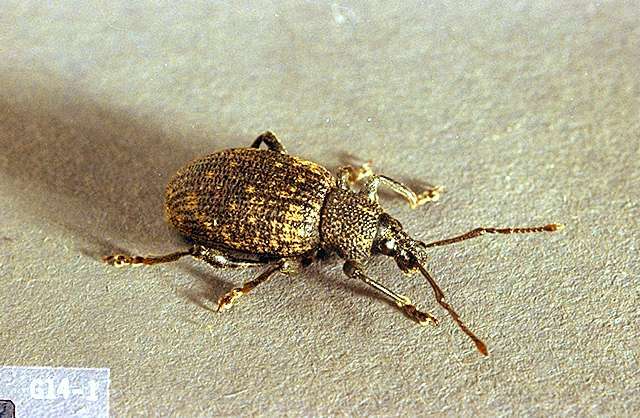 Label allows use for weevil control in Washington and Oregon only. malathion (several brands) at 1.25 lb ai/a. PHI 1 day. Do not apply when bees are foraging. phosmet (Imidan 70W) at 1.0 lb ai/a. PHI 3 days. Do not exceed five applications per season. Do not apply to bloom. thiamethoxam (Actara) at 0.062 lb ai/a. PHI 3 days. Foliar application for adult root weevils. Actara and Platium have the same active ingredient; for resistance management, do not follow one with the other. Do not apply when bees are foraging. Note "Bee Advisory Box" and restrictions on the label. thiamethoxam (Platinum) at 0.078 to 0.188 lb ai/a. PHI 75 days. Although root weevil larvae are not on the label, application made to the soil, and incorporated with irrigation, may provide some control of larvae in the soil via contact. Platinum and Actara have the same active ingredient; for resistance management, do not follow one with the other. Wait at least 5 days after application before placing beehives in the treated field. Note "Bee Advisory Box" and restrictions on the label. zeta-cypermethrin (Mustang) at 0.05 lb ai/a. PHI 1 day. Toxic to bees; do not apply when bees are foraging. Restricted use pesticide.